Having two messy boys, two extremely messy birds and a dog and a cat, a vacuum is extremely important to me!! I have been through so many vacuums over the past seven years (when my oldest was born) and non seem to last or to serve their purpose for me. I have needed something that pivots easily and gets in tight spaces (like around the bird cage.) Many vacuums cannot keep up with our demands and most like to send bird feathers flying around the house. That is not the case with the Shark Rocket Deluxe Pro! This lightweight vacuum picks up the feathers and dirt amazingly well, and does so without killing my back. With the holidays right around the corner, you might be looking for something that will get your house looking in tip top shape for your guests. If this is the case, you might want to check out this amazing vacuum! If you’re looking for a low maintenance, high powered bag less vacuum, look no further than the Shark Rocket Deluxe Pro. This small framed, high powered vacuum is extremely easy to use. There are no messy filters to clean. Most bag less vacuums are equipped with 3-4 reusable filters which get clogged after only a few uses. Many vacuums are equipped with hoses which often times get blocked with debris causing them to lose suctioning power. The Shark Rocket Deluxe Pro does not have any hoses and therefore never loses suction or power! The Shark Rocket Deluxe Pro is made to vacuum not only carpet, but hard floors as well, It comes with 2 fittings – one for carpet and one for hard floors. The motor or “main brain” of the vacuum is located at the top instead of at the bottom like many vacuums making it slightly top heavy. This actually makes the vacuum easier to maneuver. The motorized brush floor nozzle, which is the fitting used for carpet, is small but highly flexible. The floor nozzle uses a swivel maneuver for hard to reach places. This would be most comparable to zero turn technology used in lawn mowers. The motorized brush floor nozzle is equipped with a headlight to illuminate the floor space. The vacuum also comes with crevice tools for areas unable to be reached by the motorized brush. There are different attachments available for purchase for the Shark Rocket Deluxe Pro. Some include the TruePet motorized brush designed specifically to pick up pet hair and dander. There are also a variety of crevice tools and brushes. The debris canister is located at the top of the vacuum and is extremely easy and not messy to empty. The vacuum may also be stored off of the floor by mounting the included wall bracket. Overall, this is the best vacuum I have ever used. 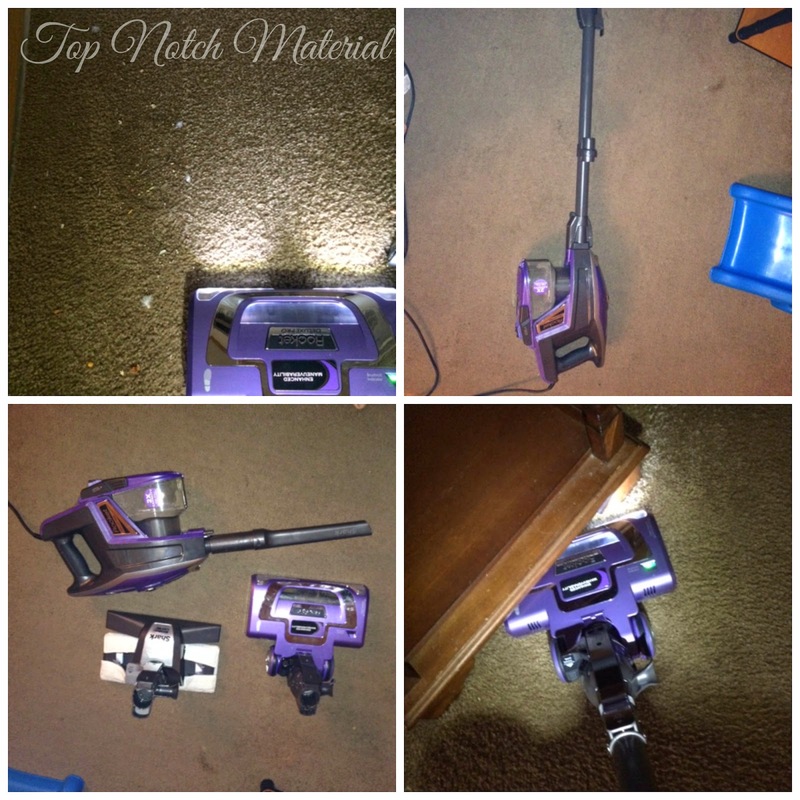 It is so lightweight and easy to use, it is completely versatile and can be used in many other ways beyond being a traditional vacuum and I love the pivot ability and its ability it get in tight spots! At less than $200, this vacuum is truly a steal! I know it will last for years to come because Shark has an amazing name and reputation! I am so glad I found them and this amazing "little" vacuum! Be sure to like Shark on Facebook so you can stay up to date on the latest products available! The size and portability make this look great when combined with the power. This would be perfect for my daughter. I need to go check it out! Thanks! I love the size, it's perfect for needing to climb up & down stairs. I really want one of these. :) My big vacuum is a Shark and I love it! (Shark Rocket Deluxe Pro Review) I have heard of these great steam mops but have never tried out one yet. I have heard that they clean really good too, want to try it real soon. Facil de manejar, hace un buen trabajo es justo lo que necesito. Me gustaria probarlo. Gracias por compartirlo.